Code Pink co-founder Susan ‘Medea’ Benjamin is being held by US immigration agents in Miami after she returned from heading up a 150 person group trip to communist Cuba, according to a tweet by her fellow Code Pink co-founder Jodie Evans. Alli McCracken, also reportedly detained with Benjamin, is the national organizer for Code Pink. As of this writing, Benjamin was incommunicado and Code Pink had not posted an update since making the announcement around 2:50 p.m. EST. When Benjamin was detained in Cairo last year before being deported she posted to Twitter about her plight and Code Pink mobilized to get her released. While in Cuba, Code Pink met with the daughter of Cuban ‘President’ Raul Castro, Mariela Castro, and at least one member of the Cuban Five. Code Pink also participated in an outdoor rally for the communist front movement One Billion Rising. Obama bundler Jodie Evans led Code Pink members on stage at the Havana rally in a celebratory dance. There were no members of the anti-communist Ladies in White or the splinter group Citizens for Democracy seen dancing on stage with Code Pink. 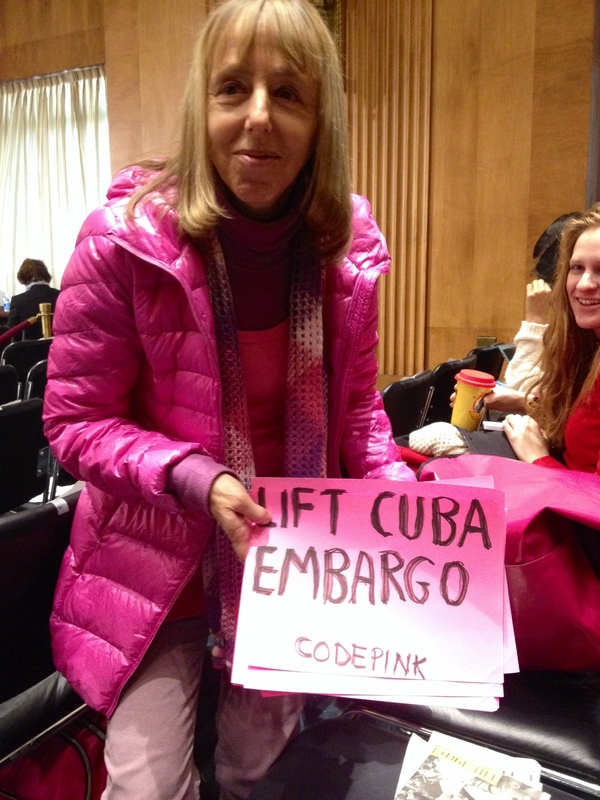 During Code Pink’s week-long visit to Cuba, the Castro government arrested nearly one hundred dissidents without a peep from Code Pink.